To be successful growing asparagus you will need an area of well drained soil in good sunlight and expect to be gardening your plot of land for a good few years to come. Once established this perennial vegetable will provide you with a delicious treat every spring. My first experience of growing asparagus was as a child when the caretaker at the school just behind our house had a big bed of Asparagus. Each year we would consider it a real treat when we were given a bunch (or maybe more) of his prized crop. Now we live in the heart of asparagus growing country so have no excuse for not passing on the secrets to success. Eating your own home grown vegetables is always so much more satisfying than buying them from the shops so you will eagerly await those first asparagus tips peeking above the ground. When asparagus season finally comes around in April – June each year you will be so glad you put the time and effort into growing asparagus yourself. Growing asparagus is not hugely labour intensive provided you get the planting right and have some patience for the first couple of years. Scroll down for links to detailed advice. However, if you are very new to asparagus growing the broad introduction below may be a good place to start. The location and preparation of your asparagus bed will determine how well your plants grow and crop. Because the plants have to mature over a number of years it will be the place they stay for a long time. You need to do some preparation before planting your asparagus to make sure the bed is in the right place and will sustain a good crop for many years. Broadly it needs to be on well drained soil, reasonably sheltered with plenty of sunlight and free from weeds. What will I be Planting? 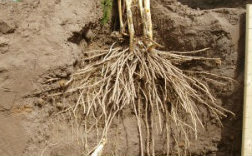 Planting asparagus crowns (as the root system is commonly know) is the usual way of establishing an asparagus bed. The terms asparagus plant and crown are widely used and sometimes these are referred to as asparagus roots. Don't be confused all of these terms are used interchangeably. Asparagus Seeds – although you mostly hear about asparagus crowns and plants you can grow asparagus from seed as well. In fact this is how the growers grow the crowns most people buy to plant! For the average gardener though planting crowns is the way forward. What do I get to Eat and When? The part of the asparagus plant that is eaten is the young shoots as they come up in the spring. These are called asparagus tips. They grow very fast so in full season can be cut daily. You will have to be patient as you can't cut and eat the tips until the plants are well established which is a 2 to 3 year process. However, once established your bed should be producing for 15 to 20 years. What is Asparagus Fern and How do I Care for my Asparagus Bed? 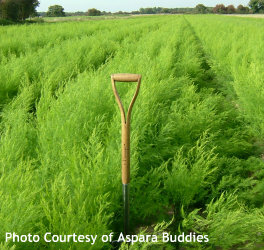 The asparagus tips can only be harvested for about 8 weeks a year without weakening the plant, when the tips are left to grow on they become asparagus fern. Look after your asparagus fern well and you can be sure of another good crop the following year. Things to look out for are various diseases, Asparagus Beetle – pretty much what its name implies an insect that you won’t want to find near your asparagus crop and the usual gardeners problems of slugs and snails. If you would like to receive our monthly newsletter please register in the box below. If you are growing or thinking of growing asparagus our newsletter will give you some timely reminders of when to do what throughout the season. Asparagus is grown all around the world from the UK, Holland, Germany, France, Spain and Italy in Europe to the USA and Canada in North America, New Zealand and Australia, Peru, Thailand and China. The most important factor for success is a period of warm weather for asparagus growth and a period of cold or in some cases draught to rest the plant and allow the fern to die back. As the fern dies back it delivers energy to the crowns or root systems that is essential for growth the following year. It has been found that the root systems continue to gain in size and weight long after the main growing season as the tops are dying back which demonstrates the importance of this period of the asparagus growing cycle. There are many gardeners enjoying growing asparagus in a small way in their gardens and allotments, sharing their surpluses with family and friends and enjoying eating their fill for a few short weeks of the year. By contrast asparagus is a thriving commercial crop with exports fulfilling the consumers desire for year round access to their favourite vegetables. Farmers are developing methods of growing asparagus both spring and autumn in the UK and the use of poly tunnels has widened the traditional season from 8 weeks to not far off 6 months (mid February to mid July) in the spring. In the UK, North America, New Zealand and Australia few growers would think of growing white asparagus whilst in Germany and Holland most of the asparagus grown would be white with very large quantities of white also grown in China. This involves grwoing asparagus without light either by heaping soil around the stems as they grow or under black poly tunnels to block out the light. A few lucky (or is it observant) asparagus lovers are able to roam their local neighbourhoods finding wild asparagus growing in the verges. In Peru asparagus is grown in warm arid conditions using irrigation whilst we have had questions about growing asparagus in warm, wet sub tropical climates as well as questions about the hardiness of asparagus to temperatures as low as -30 degrees C in Canada. Asparagus is grown in far wider circumstances and in many more variable ways that you might first expect. Our agricultural colleagues are developing varieties and techniques to keep Asparagus Lovers all over the world happy and coming back for more. One thing we are sure of is that the fresher it is the better it tastes which means that growing you own will always be worthwhile.